With the Federal Government favouring introduction of an Orphan Works exception to copyright infringement, the AIPP has asked for the reform to be fair and tightly regulated. Chris Shain (right), AIPP adviser on copyright matters, explained to the Department of Communications and the Arts how photographers may be affected by an Orphan Works exception. The federal government is in the final stages of its ‘copyright modernisation consultation’, and is also considering other ‘flexible exceptions’. These exceptions are based on the recommendations in the Productivity Commission’s Intellectual Property Final Report, released in late 2016, and includes the controversial US-style Fair Use policy. The proposed reforms were formulated way back in 2012, when the Australian Law Reform Commission (ALRC) launched the Copyright and the Digital Economy inquiry. The AIPP, with the help of Chris, has ensured the photo industry’s voice has been heard throughout the reform process. 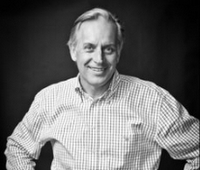 Chris, an award-winning commercial photographer, was the first elected member of the ACMP, a former director of the Australian Copyright Council, and a member of the Australian Institute of Company Directors. The photo industry has benefited immensely from his lobbying efforts. Chris had a two-hour meeting with the department a fortnight ago in Canberra to advocate fair copyright reform. Based on discussions with copyright advocacy and interest groups, Chris said the government is likely to push through the less controversial reform. Policy that isn’t as polarising as, say, Fair Use. The copyright exception applies to works that are separated – ‘orphaned’ – from their original author. If a ‘diligent search’ fails to find the owner of the copyrighted material, it can be licensed as an Orphan Work. Orphan Works beneficiaries – the most vocal supporters – are cultural institutions like libraries, universities and museums which possess archives of historical material. But the big online content aggregators clearly have an interest in the matter as well. It’s argued that important archived work is going to waste, as the copyright lifespan remains active, but the author and their family is unknown. Institutions don’t want to risk copyright infringement, but Orphan Works would allow them to digitise, display, and distribute the material. But Orphan Works could work against photographers – digital image files can easily become orphans. Strip the metadata from a photo and combine unpredictable technological change, and in a decade thousands of image files may become Orphan Works. Chris said this is a point he highlighted during the meeting. Chris recommends Australia adopts a UK-style Orphan Works system, which has benefited cultural institutions with minimum harm to photographers and creatives. 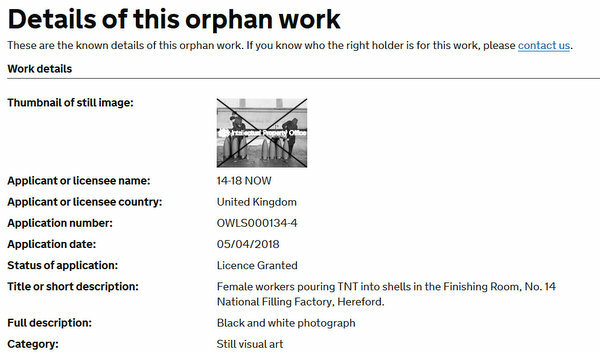 The UK introduced Orphan Works in October 2014, with the government’s Intellectual Property Office (IPO) granting licences through an online register. Applicants provide information regarding a photo, complete a diligent search checklist, outline the desired use, and pay a fee. The information then becomes available to the public, and either granted or denied a licence. If an author finds their work has landed on the register, they can either stop the application or claim the licence fee. The IPO Orphan Works register: This historical photo shows women pouring TNT into shells. The photo came from the UK Imperial War Museum archive, and the applicant is 14-18 NOW, an arts organisation that brings WWI stories to life. Source: Screenshot/IPO. Chris said that in the lead-up to the UK introducing Orphan Works, British creators were concerned the policy would harm their business. Almost four years later, Orphan Works hasn’t proved to be an issue. The IPO diligent search checklist lists a range of avenues to find an author. This includes general internet searches; following leads within the work; contacting artist associations, commercial photo agencies, and industry bodies; tracking down heirs to deceased creators; and plenty more. The IPO recognises a diligent search varies depending on the image. Regardless, it’s a complicated process, which costs time and money – not exactly a lazy trickster’s way to bypass licensing an image. The photos are primarily historical, with a large number taken during the World Wars. Applicants are mostly cultural institutes, with a handful of individuals and companies in there. Scrolling though the images, ProCounter found only a small number of contemporary photos. One example is a school portrait taken in the early ’90s of British actress Felicity Jones, to be used in a feature film produced by Columbia Pictures Industries. Another is a portrait of deceased Brazilian F1 racer, Ayrton Senna, published in Autosport magazine in the the ’90s. The applicant, a Welsh-language broadcast company, contacted the magazine which had no database records of the photo or creator. There’s another – a stock graphic ‘photograph’ of a fast travelling bullet with a swirling trail behind it. The applicant is soft drink manufacturer, Beau Drinks, which intends to use the image on product packaging. The UK Orphan Works experience shows how a government regulated system can benefit cultural institutions, while protecting rights-holders. Chris says it’s the best model for Australia to follow. This entry was posted in Deck right, News and tagged AIPP, Chris Shain, copyright, orphan works. by Keith Shipton. Bookmark the permalink.